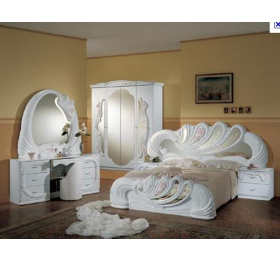 The Vanity White Italian Classic Bedroom Collection features rich white swan design with a mirror headboard and footboard, and matching set pieces. All pieces are made of strict Italian origin, shipped from Italy and is delivered to your home. 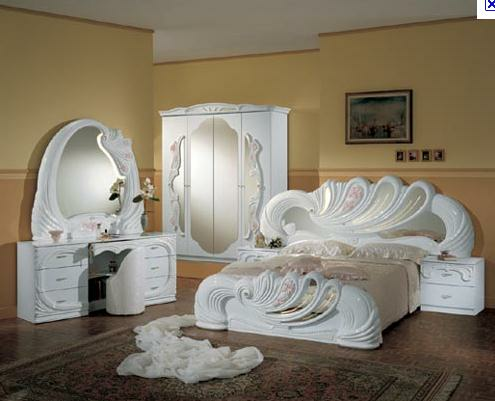 Price of this set includes a queen size bed, and 2 nightstands, dresser, and mirror. Please call to check stock availability of armoire if you wish to add it to your order. Is a available in either 4 door package deal or 6 door, finished in a high gloss and is available to order from our leading supplier in Italy and delivered + installed (optional extra) by two experienced delivery men. Also includes lights in the headboard & mirror.